A U.S. Army Corps of Engineers dredge leaves the eastern entrance to the Chesapeake & Delaware Canal section of the Intracoastal Waterway near Reedy Point, Delaware. The Intracoastal Waterway (ICW) is a 3,000-mile (4,800 km) inland waterway along the Atlantic and Gulf of Mexico coasts of the United States, running from Boston, Massachusetts, southward along the Atlantic Seaboard and around the southern tip of Florida, then following the Gulf Coast to Brownsville, Texas. Some sections of the waterway consist of natural inlets, saltwater rivers, bays, and sounds, while others are artificial canals. It provides a navigable route along its length without many of the hazards of travel on the open sea. Many species of plants and animals can be seen along the path of the ICW. The shipping hazards and safe havens of the Atlantic coast have been well known and appreciated since colonial times, and considered of great commercial, communication, and military importance to both the colonial power and the newly established, independent United States. The physical features of the eastern coast were advantageous for intracoastal development, resulting from erosion and deposition of sediment over its geologic history, but also enhanced and redistributed by the action of the Atlantic Ocean currents along it. Since the coastline represented the national border and commerce of the time was chiefly by water, the fledgling US government established a degree of national control over it. Inland transportation to supply the coasting trade at the time was less known and virtually undeveloped, but when new lands and their favorable river systems were added in 1787, a radically new and free national policy was established for their development and transportation use. Over time, internal improvements of natural coastal and inland waterways would develop into the Great Loop, which allows for waterborne circumnavigation of the eastern continental United States, using minimal ocean travel, with the Intracoastal Waterway providing its eastern end. The improvement of the country's natural transportation routes was a major concern for all geographic regions and from a national perspective of building and binding the nation. These improvements were also a source of political division about where and how improvements should be developed, who should pay, and who should perform the work. In 1808, the first federal government report on existing, possible, and likely avenues of transportation improvement was presented; it included much of the distance where the ICW now traverses the Atlantic coast. In 1802, at the request of the Senate, Treasury Secretary Albert Gallatin presented an overall plan for future transportation developments of national importance and scope. Should this great work, the expense of which, as will hereafter be shown, is estimated at about three millions of dollars, be accomplished, a sea vessel entering the first canal in the harbor of Boston would, through the bay of Rhode Island, Long Island Sound, and the harbor of New York, reach Brunswick on the Raritan; thence pass through the second canal to Trenton on the Delaware, down that river to Christiana or Newcastle, and through the third canal to Elk River and the Chesapeake, whence, sailing down that bay and up Elizabeth River, it would, through the fourth canal, enter the Albemarle Sound, and by Pamlico, Core, and Bogue sounds, reach Beaufort and Swansborough in North Carolina. From the last-mentioned place, the inland navigation, through Stumpy and Toomer's sounds, is continued until a diminished draught of water, and by cutting two low and narrow necks, not exceeding three miles together, to Cape Fear River, and thence by an open but short and direct run along the coast is reached that chain of islands between which and the main the inland navigation is continued, to St. Marys along the coast of South Carolina and Georgia. It is unnecessary to add any comments on the utility of the work, in peace or war, for the transportation of merchandise or the conveyance of persons. While Gallatin discussed the details of engineering, construction, and costs, including the national benefits to accrue from lowered transportation costs between domestic and international markets, his full $20 million, 10-year plan was never approved. That is not to say his plan was never implemented, however, for with experience in the War of 1812 shortly thereafter and the attendant British blockade, the continued need for such facility was soon highlighted. Since Gallatin had based his proposals on the known advantageous natural geographic features of the country, many of his proposals became the locations of navigation improvements that were surveyed, authorized, and constructed starting with the 1824 General Survey Act and the first of many pieces of rivers and harbors legislation, as well by individual state-built improvements. Since these 1824 acts, the United States Army Corps of Engineers (USACE) has responsibility for navigation waterway improvements and maintenance. All four proposed sections of Gallatin's intracoastal plan were eventually built; the Delaware and Raritan Canal was later abandoned for a better alternative, but the Cape Cod Canal remains in operation, and the Delaware and the Dismal Swamp portions still form part of the larger present-day Intracoastal Waterway. Starting in 1826, Congress authorized the first survey for an inland canal between the Atlantic Ocean and Gulf of Mexico, and during early developments, the growth of steam power to propel water, land, and sea transportation. Over time, additional portions of other coastal improvements were authorized for development, including the Houston Ship Channel and the Delaware River in 1872. Following the Civil War, developments to the waterway system suffered as government funding moved increasingly from navigation to railroads; over time this resulted in anti-competitive pricing and acquisition practices by railroads over water transportation, but also in insufficient haulage capacity to move the required freight to the coasts. These conditions were investigated, accompanied by considered conclusions and recommendations, as early 1873 by the Report of Windom Select Committee from the Senate's Select Committee on Transportation Routes to the Seaboard, but their plans and recommendations "received less attention than was anticipated, of course by reason of the rapid growth of interest in railways". While some policy corrections were implemented over the ensuing 30 years, continued insufficient capacity of railroad transportation became apparent following the harvest of 1906. In the River and Harbors Appropriations Acts of 1882 and 1884, Congress signaled its intent to improve waterways to benefit the nation by promoting competition among transportation modes. The 1882 act was the first act of Congress to combine appropriations for development of the nation's waterways with a reaffirmation of the policy of freedom from tolls and other user charges, first stated in 1787; it was passed over President Chester Arthur's veto, who considered it wasteful spending for the government's growing federal surplus. In 1887, the Interstate Commerce Act established federal regulation of railroads; Congress continued to promote freedom from tolls or special taxes on waterways. In 1890, Congress passed the Sherman Antitrust Act, the first federal statute to limit cartels and monopolies, but the federal government used it minimally until Theodore Roosevelt's presidency more than 10 years later. The invention of the diesel engine in 1892 eventually led to the conversion of fuels for transportation from coal and steam to diesel and the internal combustion engine. This was greatly enhanced by World War I military uses and the beginning of a new age of fuel usage and consumption. The Rivers and Harbors Act of 1909 set national policy for an intracoastal waterway from Boston to the Rio Grande, and the Rivers and Harbors Act of 1910 authorized a 9-by-100-foot (2.7 m × 30.5 m) channel on the Gulf Intracoastal Waterway between the Apalachicola River and St. Andrews Bay, Florida, as well as a study of the most efficient means to move cargo. Between 1910 and 1914, navigation channels were deepened, and the screw propeller proved efficient for improved steering and flanking qualities. Also during this period the Panama Canal Act was passed, in 1911; it proved key to the revival of waterway transportation in the United States, because the opening of Panama Canal in 1914 allowed coastal shipping to extend to the US west coast for the first time. The law also prohibited railroads from owning, controlling, or operating a water carrier through the canal and led to succeeding legislation that eliminated monopoly of transportation modes by railroads. The country's World War I experience demonstrated the need for bulk cargo transportation, with Congress establishing the Federal Barge Lines and spurring development of cheaper ways to transport farm commodities, including the first use of standardized freight barges. In 1924, Congress incorporated the Inland Waterways Corporation, generally regarded as the beginning of modern water carrier operations, and in 1925 it authorized construction of the Louisiana and Texas Intracoastal Waterway, as well as surveys east of New Orleans to Apalachicola Bay; this was the first legislation to treat the ICW as a continuous whole. The River and Harbor Act of January 21, 1927, passed by Congress, authorized the portion of the Atlantic Intracoastal Waterway, using the route planned out by the Jacksonville District of the Corps of Engineers. In 1936 the continuous 9 ft × 100 ft (2.7 m × 30.5 m) channel was completed between the Apalachicola River and New Orleans. During World War II, the need for efficient transportation of bulk materials within the continental United States was well demonstrated after German submarines sank numerous merchant ships off the East Coast. By 1942, the 9 ft × 100 ft (2.7 m × 30.5 m) ICW channel was completed between New Orleans and Corpus Christi. Today, federal law provides for the waterway to be maintained at a minimum depth of 12 feet (3.7 m) for most of its length, but inadequate funding has prevented that. Consequently, for larger ships, shoaling or shallow waters are encountered along several sections of the waterway, with these having 7-foot (2.1 m) or 9-foot (2.7 m) minimum depths from earlier improvements. While no tolls are charged for waterway usage, commercial users have been charged a fuel tax since 1978, which is used to maintain and improve facilities. That year, the Inland Waterways Revenue Act imposed a barge fuel tax; originally set at 4 cents per gallon in 1980, it was gradually raised to 10 cents per gallon by 1986. To hold these funds, the act also created the Inland Waterways Trust Fund under the US Treasury, which are used to cover half the cost of new construction and major rehabilitation of the inland waterways infrastructure (33 U.S.C. ch.32). The Water Resources Development Act of 1986 was a wide-ranging bill regarding all water resources utilization nationally. Concerning transportation on waterways, this law established the Inland Waterways Users Board to make recommendations regarding construction and rehabilitation priorities and spending levels for the inland waterways, and also gradually increased the incremental fuel tax to 20 cents per gallon by 1995. 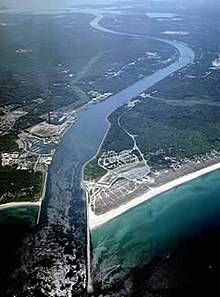 The Intracoastal Waterway runs for most of the length of the Eastern Seaboard, from its unofficial northern terminus at the Manasquan River in New Jersey, where it connects with the Atlantic Ocean at the Manasquan Inlet, then around the Gulf of Mexico to Brownsville, Texas. The official terminus point is the Annisquam River, a U.S. Army Corps maintained channel 26 miles northeast of Boston, Massachusetts, connecting Annisquam and Gloucester, Massachusetts. The waterway consists of three non-contiguous segments: the Atlantic Intracoastal Waterway (AIWW), extending from Portsmouth, Virginia (milepost 0.0) to Key West, Florida; a section of the Gulf Intracoastal Waterway beginning at Tarpon Springs, Florida, and extending south to Fort Myers; and a second section of the Gulf Intracoastal Waterway extending from Brownsville, Texas, east to Carrabelle, Florida. These segments were intended to be connected via a dredged waterway from St. Marks to Tarpon Springs and the Cross Florida Barge Canal across northern Florida, but these projects were never completed due to environmental concerns. Additional canals and bays extend a navigable waterway to Boston, Massachusetts. The Intracoastal Waterway has a good deal of commercial activity; barges haul petroleum, petroleum products, foodstuffs, building materials, and manufactured goods. It is also used extensively by recreational boaters. On the east coast, some of the traffic in fall and spring is by snowbirds who regularly move south in winter and north in summer. The waterway is also used when the ocean is too rough for travel. Numerous inlets connect the Atlantic and the Gulf of Mexico with the Intracoastal Waterway. The Intracoastal Waterway connects to several navigable rivers where shipping traffic can travel to inland ports, including the Mississippi, Alabama, Savannah, James, Susquehanna, Delaware, Hudson, and Connecticut rivers. The following natural bodies of water are included in the Intracoastal Waterway system: Albemarle Sound, Apalachicola Bay, Aransas Bay, Barnegat Bay, Biscayne Bay, Boca Ciega Bay, Bogue Sound, Buzzards Bay, Cape Cod Bay, Cape Fear River, Casco Bay, Charleston Harbor, Charlotte Harbor, Chesapeake Bay, Choctawhatchee Bay, Connecticut River, Corpus Christi Bay, Delaware Bay, East River, Elizabeth River, Galveston Bay, Halifax River, Hampton Roads, Indian River Lagoon, Laguna Madre, Lake Worth Lagoon, Little River, Long Island Sound, Waccamaw River, Winyah Bay. ^ Thomson, Charles; et, al (1787). "An ordinance for the government of the territory of the United States, North-west of the river Ohio". The Library of Congress. Retrieved 16 November 2016. ^ a b c d Zhulin, Denis Larionov & Alexander. "Preliminary report of the Inland Waterways Commission". www.ebooksread.com. United States. Inland Waterways Commission. Retrieved 16 November 2016. ^ Goodrich, Carter (1 January 1958). "The Gallatin Plan after One Hundred and Fifty Years". Proceedings of the American Philosophical Society. 102 (5): 436–441. JSTOR 985588. ^ a b c d e f g h i "Development of US Inland Waterways System". Coosa-Alabama River Improvement Assoc. Archived from the original on 7 March 2016. Retrieved 16 November 2016. ^ "Rivers and Harbors Act of 1882". Retrieved 16 November 2016. ^ "Jacksonville District, Setting the Pace" (PDF). U.S. Army Corps of Engineers. Archived from the original (PDF) on 2011-07-22. Retrieved 2010-08-07. ^ "Trying to impose user fees or tolls on barge operators is uphill battle". Pittsburgh Post-Gazette, 2012-03-21. March 21, 2012. Retrieved 2012-05-16. ^ Marston, Red. "The Intracoastal Waterway, From Cape Cod to Texas: Something for All". Retrieved 2018-06-14. ^ "Archived copy" (PDF). Archived from the original (PDF) on 2009-07-25. Retrieved 2009-12-01. CS1 maint: Archived copy as title (link) "Alperin, Lynn M., History of the Gulf Intracoastal Waterway, pp 48-50, National Waterways Study, U.S. Army Water Resource Support Center, Institute for Water Resources, 1983"
Wikimedia Commons has media related to Intracoastal Waterway. This page was last edited on 17 April 2019, at 23:08 (UTC).